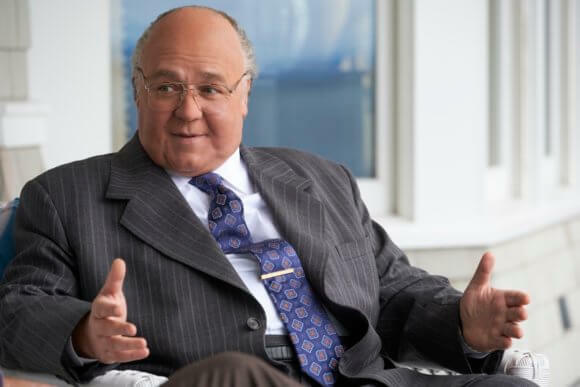 Showtime’s released the first trailer for the limited series The Loudest Voice starring Oscar winner Russell Crowe (Gladiator) as Fox News founder Roger Ailes. The seven episode series is based on The Loudest Voice in the Room, the bestselling book by Gabriel Sherman that’s an in-depth dive into Ailes’ history at Fox. The Loudest Voice is set to premiere on June 30, 2019. Episodes will air on Sundays at 10pm ET/PT. The cast of the limited series includes Academy Award nominee Naomi Watts as former Fox News anchor Gretchen Carlson, Golden Globe nominee Sienna Miller (Layer Cake) as Ailes’ wife Elizabeth, Oscar nominee and Emmy winner Seth MacFarlane (Ted, Family Guy) as former Fox News PR chief Brian Lewis, Screen Actors Guild Award nominee Simon McBurney (The Theory of Everything) as News Corp leader Rupert Murdoch, and Annabelle Wallis (Peaky Blinders) as former Fox News booker Laurie Luhn. Aleksa Palladino (Boardwalk Empire) plays Ailes’ longtime assistant Judy Laterza. Josh Charles (The Good Wife) and Josh Stamberg (The Affair) guest star. Russell Crowe, Tom McCarthy, Alex Metcalf, Jason Blum, Marci Wiseman, Jeremy Gold, Liza Chasin, and Kari Skogland executive produce. McCarthy wrote the first episode with author Sherman. Skogland (The Handmaid’s Tale) directed several episodes of the Showtime and Blumhouse Television co-production. “In today’s politically charged media landscape, no figure looms larger, even after his passing, than Roger Ailes, who molded Fox News into a force that irrevocably changed the conversation about the highest levels of government. To understand the events that led to the rise of the modern Republican party, one must understand Ailes.